The Transnistrian Republican Bank have announced that they will issue new currency units that will be made of composite materials. The currency items are primarily being issued to commemorate the twentieth anniversary of the national currency. 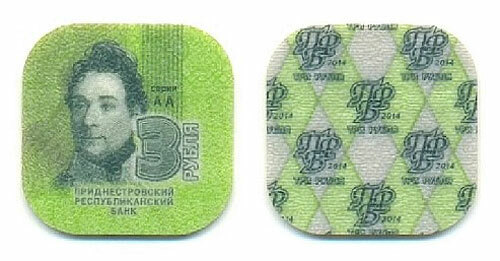 The composite material or Plastic coins will have a different geometric shape and color depending on denomination. The four coins, from one ruble to ten rubles are to replace the banknotes of the same denomination. The Press office of the Bank have indicated that the new money will combine the best qualities of both coins and banknotes with high wear resistance and a wide range of security features. The Press office have also indicated that the coins for use in Transnistria were developed in Russia. The information distributed to various news media agencies mentions that this type of composite material money is not produced anywhere else in the world. First Deputy chairwoman Olga Radulova indicated and confirmed that the innovative currency units were designed by colleagues from the Russian Federation and that Transdinistria are the first to use them. The move is seen as an alternative to producing expensive metal coins as well as to meet public demand for small value denominations. The new coins take their cue from plastic banknotes which are in use in many countries of the world but the coins made ​​of composite materials will appear for the first time in Transnistria as a test market. For protection against counterfeiting, the technology of their production involves the use of a special texture, contour elements, micro texts and specific reflection of light when exposed to ultraviolet and infrared light. The plastic coins will be introduced into circulation from the 22nd August 2014 and will have a parallel circulation with paper money of the same denomination. 1). One Ruble, portrays A.V. Suvorov, 2). Three Ruble portrays F.P. De Volan, 3). 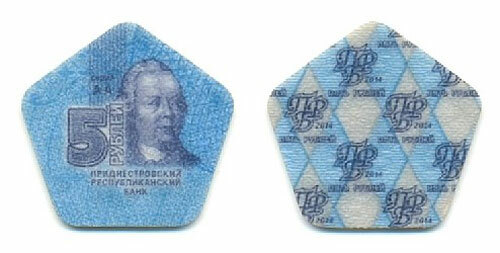 Five Ruble portrays P.A. Rumyantsev, 4). Ten Ruble portrays Empress Catherine II. The reverse of each denomination includes a diamond-shaped design which includes the initials of the National bank & denomination in print and the year “2014” The coins and banknotes of the same denomination are expected to circulate alongside until the notes are gradually replaced by the coins. The Republic of Transdnistria, a break-away Russian enclave territory declared their independence from the Republic of Moldova in 1992, only Russia recognizes their legitimacy. The Transdnistrian ruble, at a par with the Russian ruble – are issued through the authority of the Transnistrian Republican Bank since 1994. The Bank regularly issue collector coins produced in precious and base metals, the coins are produced by the Moscow and St. Petersburg mints. Remember that I was one of perosn who seggested for plastic coins for United States of America. So if Russia can do it. Why not United States of America? Yes, you mentioned plastic money – maybe you’re on to a trend waiting to happen? 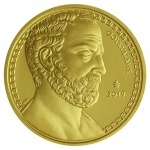 The problem with plastic coins is simply the perception, if the coins in circulation are made of a plastic substrate because the coins represent inflationary conditions or the denomination represented is so small & without value (as these denominations suggest) that they do not merit a coin made of any metal, then it would surely result in the public’s avoidance of their use since it may not be worth their while. Plastic coins, you just can’t get anymore bush league. Plastic, unbelievable, just who would want to collect, cheap plastic coins? I can see it now Get your plastic silver looking silver dollar now,, lol !!! I would like to purchase some of the plastic coins, but have no Idea on where to look ? can anyone help me out on this ? thanks In advance for all help on there new plastic coins !! As these are very much prototypes, in the sense that this little limited and very subsidised economy is a test market, and these are the first of their kind, as far as we know, we all will simply have to see the reception given these pieces. Many of us know firsthand the reception given some coins which have 1) taken the place of banknotes and how many economies were challenged to get the public to accept a coin in the place of a note and 2) how some coins were rejected by the public due to their “cheap feel” and look. Yes, when there’s no other alternative to the needed denomination, the item is used but before substrate coins or tokens are used in developed economies, I would imagine there would need to be much more study on the subject and not from an economy and political situation as Transdnistria. I think these coins will eventually see their way to the many international coin fairs and websites, the first place to check would be on e-bay or similar auction sites, the Transdnistrians will pick up on their novelty value and most likely will post them for sale in no time. Just a few corrections: the PMR rouble is not at par with Russian rouble, it is worth more. Also, Transnistria is not recognized de jure even by Russia and it is not a “Russian enclave territory”. Their coins have also been minted in many other countries than just Russia, such as Poland and Germany. Aren’t they like casino chips? People respect, use, and even steal them so I think the acceptance of plastic coins would be no different. Of course not in America, it is the exception to every dollar bill/coin, cent/penny, or inch/meter rules. 1; Russia does not officially regognised PMR. They only provide some support. I stand corrected, the Transdnestrian ruble does not trade at a par level with the Russian ruble, it trades more closely to that of the Moldovan Lei which currently trades at 12 lei per one USD and the Transdnestrian ruble at 11 per one USD, apologies for that. Yes, I should have amended my information to state that the Russian Government recognises Trandnestria by de facto, rather than officially – meaning “existing or holding a specified position in fact but not necessarily by legal right” or “in practice or actuality, but not officially established” since Moscow accords more recognition to Tiraspol than any other UN member state. In this regard, it has more than once been referred to as a “Russian enclave” or “outpost” by several media outlets though this is also not an official designation but rather more commentary. Holders of a Transdnestrian passport for instance, which are issued by their foreign office to qualifying residents in Transdnestria may travel to Russia with them and if they wish to travel further, it is my understanding that Russian passports or official travel documents may sometimes be provided since Transdnestrian passports cannot be used for wider international travel. The Russian Federation provides military support with the stationing of almost 2000 ground troops in the territory and contributes to their economy financially as well as with trade links not accorded to it by its immediate neighbours unless it trades through Moldovan channels. And, some can argue that this tacit support is the very reason why Transdnestria still exists against all or most international criteria which makes recognising this state almost impossible, but, that is for qualified diplomats and perhaps UN or EU mediators to iron out. As for the collector coins of Transdnestria, those which I have in my archives and are the silver proof commemorative examples, I seem to remember the certificates accompanying them indicated that they were produced by the Moscow Mint. If other Mints outside of Russia have produced either circulation or commemorative coins, I have not seen any evidence of this. I Thing Plastic Coins will Eventually see their way to the International Coin Fairs and Markets. Transnistria is part of Republic of Moldova currently occupied by russian troops. Therefor all transnistrian coins are counterfeit. The only legal currency in the region is Moldovan Leu. No bank in the world would give anything for that non-existing currency. Yes, as it stands internationally, Transdnistria is part of Moldova’s geo-political territory and the enclave is to my understanding, not recognised by any other country other than Russia which has a de facto type of recognition, I understand the situation is complicated! The Transdniestrian ruble and its coins are used by most of the inhabitants of Transdniestria and therefore, the currency comes under some type of local recognition although as you have pointed out, it is not exchangeable anywhere outside of the enclave but is not per-say, counterfeit. I have never seen these coins in use in Transnistria, so I doubt they are out. I myself have only seen them at coin shows and for offer on websites as I have not traveled to the region. Yes, Romania were one of the first European countries to utilise polymer banknotes but I believe their coins are still produced in metal variations. Denmark will be contracting out the production of their coins and banknotes from 2016 as the national Bank have advised they will no longer produce currency owing to the increased cost and decrease in the use of coins and banknotes for daily transactions – it is the opinion of the National Bank that electronic transactions are more popular with the Danish people. In this regard, it may be that the Danish public see polymer banknotes if this is agreeable with the National Bank and is is determined that this move saves in production costs. We will certainly be the first – if not one of the first bulletins to report this development. Thank you very much for this page. Our pleasure, I haven’t heard any updates for these pieces so if anyone out there does have any further information for these innovative coins, do let us know. I was in Transnistria in May 2016. The plastic coins are still in circulation but the locals don’t like them and they end up in banks, supermarkets, post office and in restaurants. Only odd tourists like me ask for them. They are happy to give them to you at face value. It is very easy to get hold of them if you are there. On EBay etc they sell many times the face value. I live in transnistria. I will say that these coins are a very strange invention. on the one hand it is convenient for blind people. since all 4 coins chips have a different shape. different color should help not to confuse and again remember the color. in practice, very uncomfortable. in hand it is bad to hold and inconvenient to count. maybe it’s because I’m used to paper money. as I do not like pennies at all, they are small and light. This is my subjective opinion, it may differ from the majority.